Caesars Palace Las Vegas celebrates 40th birthday with massive free toga party and an after party at PURE Las Vegas night club. 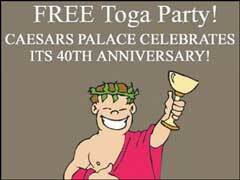 On Wednesday, August 2, Caesars Palace will celebrate its 40th anniversary with a toga party at the Caesars Palace Las Vegas outdoor Roman Plaza amphitheater. Jenny McCarthy will host this celebrity event. It will feature a live performance by Otis Day and the Knights, the band that rocked “Shout” during the toga party scene in National Lampoon’s Animal House. Following the musical set, toga-clad partygoers will be invited to an after party at PURE Las Vegas night club. Hours: Open daily. Until October, 8 a.m. - 8 p.m.
Food/Drink service: Yes, during the summer only. Apollo, Neptune, Venus, Temple Bar is open 8 a.m. to 8 p.m. and Snackus Maximus, which serves drinks and food poolside, is open 10 a.m. to 6 p.m. Chairs and chaises: They can be reserved. Cabanas: Can be reserved. Soft top cabanas are $150 per day (Monday - Thursday, excluding holidays) and $200 per day (Friday - Sunday). Hard top cabanas (which have air conditioning) are $200 per day (Monday - Thursday, excluding holidays) and $265 (Friday - Saturday). The Venus Pool allows European-style sun bathing. Caesars Palace Las Vegas Hotel swimming pool European-style sun bathing is restricted to the Venus pool only. 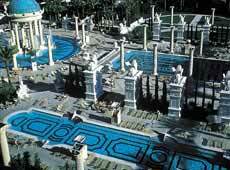 At Caesars Palace Hotel, there are 4.5 acre Garden of the Gods Pool Oasis. Imagine four sapphire pools, two whirlpool spas all surrounded by lush green lawns, graceful fountains and classic marble statues. It’s truly a place fit for the gods Caesars Palace Casino Las Vegas. The circular Temple Pool, at Caesars Palace Casino and Hotel is the focal point of the area with its 10,000 square feet of flowing water and is covered with a giant rotunda that tops a central island. As with all of our pools, the temple pool is decorated with fine marble and granite and rimmed with ancient mosaics. The World Series of Poker revised Caesars Palace Las Vegas Circuit schedule includes a new $5,000 buy-in event that will test entrants’ expertise in four games - Omaha, hold’em, stud eight or better and stud.